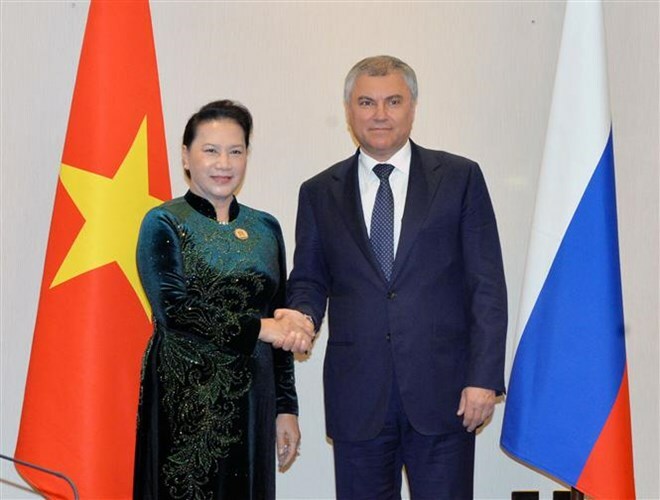 Doha (VNA) – National Assembly Chairwoman Nguyen Thi Kim Ngan and Chairman of the State Duma of Russia Vyacheslav Volodin agreed that parliamentary cooperation is one of the important pillars of Vietnam-Russia ties and it has made a lot of developments recently. They shared the view at their meeting on the sidelines of the 140th Assembly of the Inter-Parliamentary Union (IPU-140) in Doha, Qatar on April 7 (local time). The NA Chairwoman Ngan said political ties between the two countries have been growing over the past years, with the exchange of regular visits via the Party, State, local, business and social organisation channels. As the two nations are actively preparing for the Vietnam Year in Russia and the Russia Year in Vietnam this year and the 25th anniversary of the signing of the Treaty on fundamental principles of Vietnam – Russia friendship and the 70th anniversary of the establishment of bilateral diplomatic ties by 2020, she asked for mutual support to launch activities in the list of priority tasks and hold celebrations during the year. The leaders spoke highly of the establishment of the Inter-Parliamentary Commission on Cooperation between the State Duma and the Vietnamese legislature in December 2018. The top Vietnamese legislator expressed her belief that the commission makes important contributions to ties between the two legislatures and nations. She suggested that both sides should maintain the exchange of visits by officials of the two law-making bodies, their committees and friendship parliamentarians’ groups, enhance the supervision of signed agreements and cooperation projects, build and refine legal framework in support of the two countries’ governments, localities, businesses and people; facilitate exchange, consultation and mutual support at multilateral parliamentary forums. Volodin, for his part, said ties between Russia and Vietnam have stood the test of time and will grow further in the future.